Pathology table guests during the recent Gala Dinner celebration for the 60th Anniversary of the Academy of Medicine, Singapore, held at the Grand Copthorne Hotel, Saturday 22nd July, 2017. 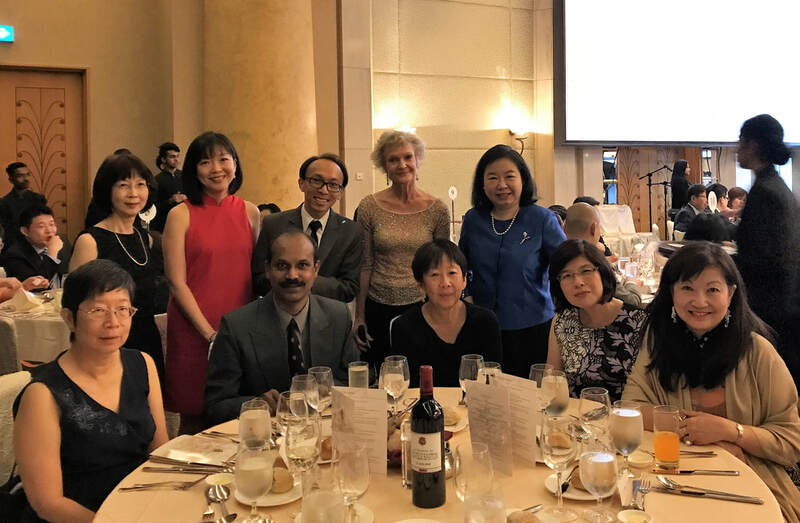 An invitation to attend the dinner as a guest of the Academy of Medicine, Singapore Chapter of Pathologists was extended to Dr Lynette Oon, as President of the Singapore Society of Pathology (seated 2nd from right). and Dr Tan Ai Ling and Dr Sathiyamoorthy Selvarajan (front row, left to right). Standing in the back row was the international guest, Prof. Annie Cheung, President of the Hong Kong College of Pathologists, next to Dr Inny Busmanis, Chair, Chapter of Pathologists, Academy of Medicine, Singapore. We have had a successful and well-received 1st Singapore Pathology Conference and 36th SSP AGM. The SSP Exco would like to thank all who had attended the events for your support. We were privileged to have Professor Gregory James Tsongalis as our MOH HMDP expert in Molecular Pathology from 26-30 September 2011. Professor Tsongalis is Professor of Pathology at Dartmouth Medical School and Director of Molecular Pathology in the Department of Pathology, Dartmouth-Hitchcock Medical Center in New Hampshire, USA. He is a well-known expert in the field of molecular diagnostics. He gave a series of 11 lectures which were well-received by the Singapore pathology community. He has generously agreed to share the slides from his lectures which are available below.